This story is the fourth installment in a series on copper reduction. Part I was published in the Feb. 13 issue; Part II and III were published Feb. 27 and March 13, respectively. While this is the final installment of this series, The Log will continue to report on TMDL throughout the year as it becomes relevant. There are nearly 827,000 registered recreational boats in California, according to a study jointly published by the National Marine Manufacturers Association and Michigan State University in 2012. California’s recreational boating industry was responsible for $3.8 billion in annual spending and nearly 72,000 jobs in 2012, according to the report. The total economic benefit of recreational boating in California was $8.94 billion in 2012, the report added. Comparatively, Super Bowl 46, which was played in Indianapolis, Indiana, in 2012, had a total economic impact of $323 million, according to a study conducted by Rockport Analytics. Mobilizing the state’s recreational boaters and requiring them to reduce copper use on their respective hulls and instead rely upon non-toxic alternatives could prove difficult and costly, especially since questions remain unanswered. After all, copper is not illegal in California and some corners of the recreational boating industry still question whether the substance actually impacts water quality as state officials contend. Still, with areas such as Shelter Island, Marina del Rey and Newport Beach already taking steps to reduce copper levels through Total Maximum Daily Load (TMDL) restrictions, perhaps the day is not too far away when a majority of recreational boats registered in Southern California would be subject to some form of copper-reducing program. If such a day does arrive, what options exist for boaters? Just the same, what is the best method to determine the impacts of copper in any given harbor or marina? In its copper-reduction promotional campaign, the Port of San Diego stated it analyzed 46 hull paints to determine which ones best prevented antifouling and were cost-effective. The port determined 22 of the 46 hull paints tested had performed well and were worthy of recommendation. The 22 paint manufacturers were separated into five categories: soft non-biocide; hard non-biocide; zinc oxide non-biocide; organic biocide; and, zinc biocide. A full list of good-performing alternative hull paints can be found online at portofsandiego.org/environment/copper-reduction-program.html. Other suggested alternatives include slip liners and less-abrasive hull-cleaning techniques. Wayne Chiu, a water resource control engineer with the San Diego Water Board, explained that the Port of San Diego is making a strong push to educate the public about alternative hull paints and coats. “There is a lot of movement on that front,” Chiu said, adding there are more alternative paint options available on the market than ever before. Chiu said public acceptance of alternatives is a work in progress, but people will eventually come around once they understand the benefits and cost savings. Copper paints are easy to understand since it works immediately, Chiu said, but require additional maintenance over the long haul. 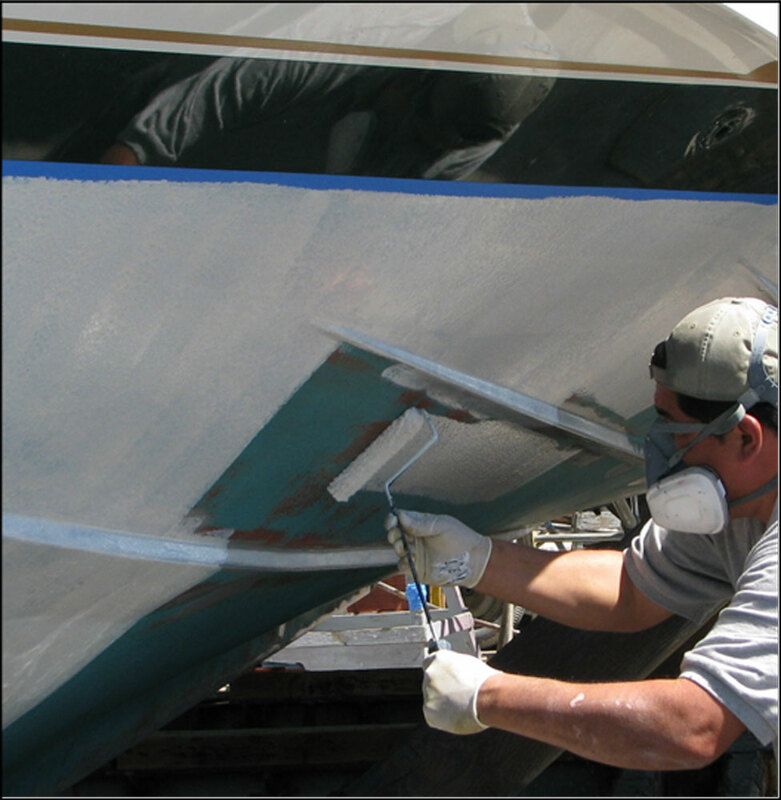 Comparatively, alternative hull paints and coats last longer and require less maintenance, even though it is not as apparent at the outset thought. The major issue with Shelter Island and the port in general, Chiu said, is poor flushing. There has been a noticeable trend of water quality improvement since TMDL was adopted, but maintaining proper water health within San Diego Bay is difficult because the harbor drains to the ocean at one location. Accordingly, any pollution entering the bay, whether it is from boat hulls or elsewhere, potentially stays in the water for a longer period of time. “We see things happening, we’re just not sure things are moving quickly enough. The science isn’t completely in,” Chiu said. The water is improving, he said, but negative elements are continuously entering the harbor, but the harbor’s restrictive flow makes it difficult to reduce previously measured copper levels from the bay. Accordingly, no one is sure whether the improvements would result in a rebound or yield long-term results. “The environment can be resilient if you allow it to bounce back. Nothing is beyond the point of no return,” he said, noting the only way nature will rebound is if people limit the amount of negative elements they allow to enter the water. A few hundred miles away in Santa Barbara, the Waterfront Department published an annual review of their participation in the Clean Marina Program in March 2014 and reported success in using zinc-based bottom paint on an aluminum-hulled 33-foot fire boat. However, the department found other non-copper antifouling paints, such as ceramic coatings and Econea, were not as effective as zinc and not worth pursuing. Waterfront Department officials had experimented with anti-fouling paints on its patrol boats since 2009. Since zinc-based bottom paint reportedly worked well on its fire boat, the department began testing it on a 22-foot Radon. Results from the testing have not yet been made public. A water quality fact sheet issued by the California Coastal Commission in 2011 said boat hull maintenance could impact water quality, but the long-term effectiveness of non-copper alternatives depends on a variety of factors. According to a fact sheet published by the Institute for Research and Technical Assistance (IRTA) in 2012, soft nonbiocide paints were considered ideal alternatives to copper. IRTA recommended two soft nonbiocide paints: Hempasil X3 and Intersleek 900. In 2013, state legislators approved Assembly Bill 425, which was authored by Assemblywoman Toni Atkins (R-San Diego) and signed into law by Gov. Jerry Brown. The law required the state’s Department of Pesticide Regulation (DPR) to issue a report to help legislators develop a policy to protect water quality and marine life without burdening boat owners. During the legislative process, Atkins said in a statement the bill would force DPR, which had been studying copper and antifouling paints for years, to issue recommendations based upon its research and help policymakers make informed decisions on how to regulate water pollution in marinas. DPR staff published a report in January 2014, recommending state legislators and local officials consider implementing site-specific objectives, as suggested by Johnson and Leneman. “Some marina locations (e.g., Marina del Rey) may not achieve the current California Toxics Rule chronic water quality criterion for copper … at all times even with the implementation of copper [antifouling paint] reformulation and other mitigation approaches. Therefore, dischargers or TMDL-responsible parties may consider pursuing site-specific objectives,” the report stated. Just the same, DPR staff told The Log waterfront venues should attempt to coordinate cooper-reduction efforts. Another advocate for studying water quality on a case-by-case basis was Kevin Ketchum, president of the Marina Recreation Association (MRA). Ketchum said the marina operators and water board officials should rely on site-specific modeling to fully address copper and toxicity levels at each recreational boating venue. “This is not a clean water issue. Everyone is pro-environment,” Ketchum said. He added boaters, marina operators and policymakers need to rely on the best available science in developing the right strategies to addressing copper and toxicity. Many marinas in the San Francisco Bay Area, he pointed out, employ site-specific analyses when studying water quality and determining methods to address potential toxicity. It is important to note not one definitive path to address copper pollution in local marinas has been developed since The Carson Report was published in 2002, potentially giving some credence to those advocating a case-by-case approach to addressing copper. For the time being, addressing copper level in local waterways will remain a work in progress.